fundamental conceptual errors. It should not be considered a true Zen garden. garden at Ryoanji is to stimulate meditation. Yet that is not the purpose of the garden. value of the koan and stressed instead the importance of "sitting in meditation" zazen. 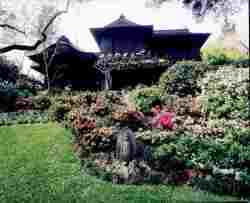 part of a Zen temple, while the garden at Huntington is part of a botanical garden. resembles the dry garden at Ryuanji minus the moss that surrounds these rocks. confusion, questioning the credibility of the design and purpose of the garden. garden. To the far left, in front of several plants are placed two large jagged rocks. viewer is forced to engage in a visual tug-of-war with competing stones. seated in front) or are they meant for the visitor to face to small grassy area? assorted bushes. There isnt any particular style or design that stands out to the visitor. One distracting aspect is that some of the plants and bushes seem to be home to squirrels. composition is cluttered with too many plants, rocks, and flowers. and wood causes the dry garden to diverge from the main concept of a Zen garden. coexistence with the natural environment. 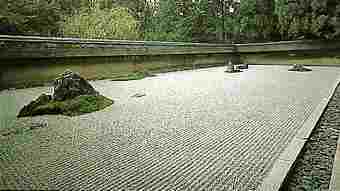 resemble Ryoanji, with the smoothness of the small rocks, briefly interrupted by rocks. reminiscent of monster truck tire treads. round and flowing aesthetics of the entire dry garden. seen are the gentle pattern of ripples that a stone causes when dropped into a pond. gravel bed can be seen as islands, the temple itself is an natural island in the wilderness. Surrounded by thick forest Ryoanji appears as an oasis, resembling the dry garden itself. is an excess of color. The overuse of plants creates a heavy burden of the color green. large bushes with flowers of two different colors. viewer. There is simply too much materials that pull the viewer in too many directions. of a city rather than nature. garden to appease the western viewers preconceived notions of the "Orient". actually allows the mind to conjure many aspects of nature. it is the physical form the Zen Buddhist concept of the koan. second class replica of misguided attempt to create a Zen garden.